First, I'd like to say that if you haven't read the previous post, I suggest you do, so that what I'm about to say will be understood in its full context. Here is what has been established so far ... Jesus is sitting upon His throne, in all His glory, and judging the "sheep" and "goats". The sheep have been judged righteous, and it has been pronounced that they will "inherit the kingdom". The goats, on the other hand, have been judged cursed, and have been sentenced to the "eternal fire prepared for the devil and his angels". These are very serious pronouncements, and it is important that we grasp their meaning and understand them correctly. As I postulated yesterday, it is apparent that ministering to the hungry, thirsty, strangers among us, and the imprisoned is important to Jesus. In fact, He makes a point of calling these unfortunate souls His "Brethren". In the past, I have assumed Jesus was making a statement from His carnal position, regarding the treatment of all mankind. But as I have spent more time contemplating this important passage, I have begun to see just who He is addressing. In verse 32, the Bible says Jesus has gathered "all the nations" before Him, and separated them as "a shepherd separates the sheep from the goats". We've also established that sheep represent obedience, while goats represent rebellion. But notice this: Jesus has gathered nations. Now, some translations go on to say that He "will separate people one from another", while other translations say, "All the nations will be gathered before Him, and He will separate them [implying nations] one from another". I submit that those translations that use the word "people" are referring to ethnic groups [peoples] or speaking of a group of citizens, collectively, of a nation. And here is where we get to the decisive and most important points of Matthew 25:31-46. Because Jesus is sitting on His throne on the earth, and all the angels are with Him, I see that the bowls of wrath have been poured out, the battle with the Anti-Christ and his followers at Armageddon has taken place, and this is the beginning of the Millennial Kingdom. This scenario is about more than people ministering to the unfortunate of the world, however important that is to our King. 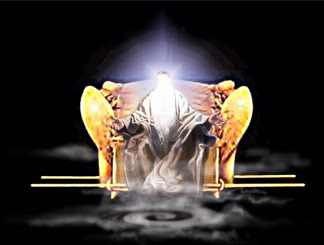 This is a picture of Jesus seated on His Judgment Throne. More importantly, it is critical that we understand that [at this point in Matthew 25] there has been a transition from the Church Age to the Millennial Kingdom. Admittedly, I am no Bible scholar. But I know that all of the Bible has been given to us so that we might seek to understand our God and participate in His redemptive plan for His creation. While it is true that Jesus tells us that no man knows the day nor the hour of His return, He also tells us to "Stay awake!" and be on guard for the events to come. I will also admit that the Bible is a mystery as to how these events unfold. And I am still trying to make all the puzzle pieces of Daniel's 70th week, Joel 2, Ezekiel 38, Zechariah 14, the Book of Revelation and Jesus's warnings in the Gospels into a cohesive picture so that I will not be caught unaware and surprised by the "thief in the night". So, if we look at the verses just prior to the separation of the sheep and goat nations at the Judgment seat, we will find that Jesus has delivered His parable of the Talents. This is a picture of the first phase of Jesus's judgment in which the saints (raptured Believers) will be rewarded according to the fruit they bore for the Kingdom. In 25:23, Jesus says to these saints, "Well done, good and faithful servant; you have been faithful over a few things, I will make you ruler over many things. Enter into the joy of your Lord." This is confirmation of Timothy 2:12 and Revelation 20:4, that we will rule and reign with Christ in the Millennial Kingdom. The Parable of the Talents is immediately followed by verses 31-46, which show us the second phase of Jesus's judgment from the Throne. This judgment is directed, not at the saints (Believers) but at the unregenerate nations that survive the coming of Christ and Armageddon. Remember, these are unredeemed nations that are standing before Jesus, and they will be judged as to whether they are allowed to enter the Millennial Kingdom. So, now the obvious question is, why are some of the nations judged as sheep, and some as goats? I believe that Jesus is designating the sheep nations as those nations, ethnic groups, or peoples that cooperated with the brethren of Christ in resisting the Anti-Christ during the Tribulation. These sheep nations may not have been Believers in Christ, but they assisted Christians by housing them, feeding them, and ministering to them in prison during the persecution of Christians by the Anti-Christ. That's why the sheep nations ask Jesus, when did we do all these things? And He answers, as you did it to one of the least of these My brothers, you did it to Me. NOTE: I have an additional question about Jesus's answer, that I have not solved yet. Who is Jesus referring to as His brothers? Are Christians the only people qualified to be called His brothers? Could He also be referring to the 144,000 Jews who are sealed with His Father's name on their foreheads? After all, Jesus was from the tribe of Judah, and these 144,000 are mentioned along with the multitudes that appear before His throne in Revelation 7. I don't know if Scripture identifies these two groups "collectively", as Jesus's brothers. At this point in my journey, I cannot definitively say. But I am willing to say that that He identifies these "brothers" as members of His Father's Kingdom who have been protected by the sheep nations. I will also tell you that I had to take off my rose-colored glasses to dig into these verses. I had read them so many times and just accepted the "easy answer" that Jesus was commending Christians for being, well ... good Christians. But then there was verse 41 and He is cursing people and condemning them to "the eternal fire prepared for the devil and his angels". That just didn't make sense if He was addressing Christians. And I had to remind myself that when the Holy Spirit inspired the original writers of the Bible, the Holy Book wasn't broken into neat little sections with titles. Yet, here, one of my Bible translations (KJV) tells me that verses 31-46 are about the judgment of the Gentile nations. How many times have I just skipped over that because it didn't fit my current understanding of the Bible, and I couldn't see the connection between the Parable of the Talents and the judgment of the sheep and goats? But there was still something that I had to work through. How could Jesus call these unbelieving sheep nations "blessed by My Father" (verse 34) and "righteous" (verse 37)? And how could they be allowed into the Millennial Kingdom if they hadn't believed in Him during the Church Age? Here is how I understand it now (until the Holy Spirit reveals more) ... They could be the unsaved people who survived the Tribulation and return of Christ to be facing Him at His Judgment Seat, and because they helped the saints during the Tribulation [by feeding them, clothing them, visiting them in prison, etc]; in other words, supporting "the agenda of the Brethren", their actions have been credited to them [imputed] as righteousness, and they are allowed to enter the Millennial Kingdom as citizens who will be under the rule and reign of Christ and Christian saints. Meanwhile those goat nations continued in their rebelliousness towards God and sided with the Anti-Christ, persecuting the Brethren. Their "reward" will be punishment in the eternal fires of hell. So, in conclusion, once again I have discovered that I cannot take verses of the Bible out of context. I must read it with a discerning spirit and see the whole picture. The Return of Jesus is at the center of Matthew 25 -- all of the chapter. 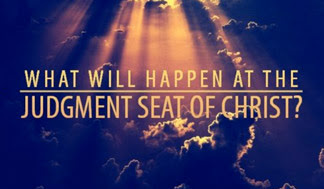 And we are given a view of the Judgment Seat of Christ. We saints will be judged to determine what kind of reward we are to receive, based on the fruit we bore for the Kingdom of God. It is not about salvation! It is about the work we did for the Kingdom. Then Jesus will judge the nations according to their works -- the sheep nations will be rewarded for cooperating with the agenda of the Kingdom and allowed to enter the Millennial Kingdom ... I was thirsty and you gave Me drink. But the goat nations will also be judged for their works with the Anti-Christ. It is clear to me that the destiny of nations at the commencement of the Millennial Kingdom will be determined on the basis of their partnership with the Kingdom of Heaven on earth during the Tribulation. And that, my dear Brothers and Sisters in Christ, is why it is so important for us to be influencing communities, cultures, and countries for Christ. There is a time when the world will be at war with Christ and Christians, and how we impact nations and peoples now will bring the Church into its final destination. It is exciting and a profoundly significant responsibility for the Body of Christ. Are you ready and willing? Matthew 24:14 Yet through it all, this joyful assurance of the realm of heaven’s kingdom will be proclaimed all over the world, providing every nation with a demonstration of the reality of God. And after this the end of this age will arrive.